We will be exhibiting on booth 635. We will be exhibiting on booth 2534. We will be exhibiting on booth 106. You can also hear from us in various sessions details below. 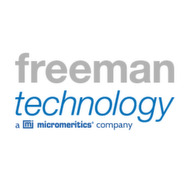 Powder characterisation specialists, Freeman Technology, will be exhibiting at Analytica for the first time in Hall A2 Stand 423 (10 – 13 April 2018, Muenchen, Germany). The company will be showcasing their material characterisation solutions. Freeman Technology will be exhibiting on booth 318 at this year's event. Freeman Technology will be exhibiting in Hall 4 Stand 547 at this years event. Freeman Technology will be exhibiting on booth 2591 at the IFT17 Expo this year. Freeman Technology will be exhibiting on booth 403 at this years event. John Yin will also be presenting new research "Characterising Iron Alloy Powders to Optimise Near-Net Shape Manufacturing". Invitation to Material Characterization Seminar Freeman Technology invite you to attend a Material Characterization Seminar on June 7th at the InterContinental San Juan. Hosted by Tim Freeman (Managing Director, Freeman Technology). Hosted by Freeman Technology and Surface Measurement Systems. With guest speakers from Pfizer and Vectura. For a copy of the agenda please visit our website. The aim of this two day event is for delegates to gain knowledge about how to analyse particle size and shape as well as understanding the flow properties of powders with cutting edge technology. Freeman Technology will be exhibiting in Hall 5 Stand 235 at ECS 2017. Dr Doug Millington-Smith will also be speaking on the topic of "Characterising Powder Flow Properties - The Need for a Multivariate Approach" on the 3 April at 4.30pm. Freeman Technology will be exhibiting and presenting at DPI China in Shanghai. Tom Qin will be speaking on the topic of "Advanced Powder Characterisation for Formulation, Process Optimisation and QA/QC of DPI Powders". Freeman Technology, the powder characterisation specialists, will launch the Uniaxial Powder Tester (UPT) at Powtech 2016 (19 April – 21 April, Nüremberg, Germany). Meet the team on stand #4-547.